A projectile courgette carves a path, like Gravity’s Rainbow, from the stage into the audience. This is music with menaces and only one of many signs that tonight is not the usual gig fare. When an artist is able to weaponise vegetables, you know they’re on to something. 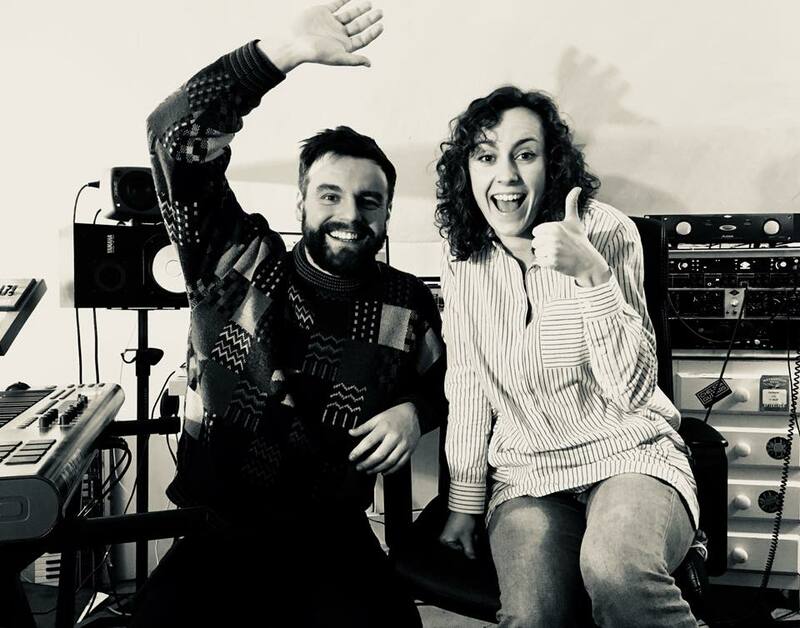 Kaze are the Manchester-based two-piece formed by Amy Webber and Graham McCusker. Neither are native Mancunians but then so many of us fall into that category, drawn to this big, noisy gorgeous city for whatever reason pulled us here. McCusker is Scottish, Webber Kentish, but they met while studying opera (of all things) at the RNCM. And that knowledge, ability and wisdom seeps and creeps through their music, with beautifully-crafted songs delivered with a real sense of theatre and performance. For many songs Amy is joined by a female mime, for instance, carving shapes to the music like an expressionless, dark shadow. At other points, rose petals are spun into the crowd like snowflake confetti falling in a Manga fairytale. And then Webber nearly takes someone eye out with a well-aimed courgette. This is music + performance + danger. The word Kaze means ‘wind’ in Japanese but if you’re surfing Spotify don’t get waylaid by the Spanish hip hop outfit of the same name. These guys make bright, quirky, spirited theatre pop, with edges. Tonight the pair are accompanied by drums, guitar and bass to flesh out the music and it’s a tight, punchy sound. The songs tell stories, Amy reading between songs from a journal as though the audience has been invited into her bedroom, into her thoughts. It’s a warm and engaging evening, in the perfect place for their music and Kaze’s new single launch. Imagine the Castle is a Tardis designed by Dante Gabrielle Rossetti – indeed any of the pre-Raphaelites – and you will have some sense of the venue for the evening. The venue is already reminiscent of the pub from the not-nearly-funny-enough time-travelling sitcom Goodnight Sweetheart (complete with a disjointed internal logic that never quite cohered). So there’s a small front pub area, a side corridor past a snug and down to the venue that looks like it can’t hold more than a decent-sized committee meeting… and yet seems to accommodate biblical numbers, certainly tonight, a night when Kaze pack them from low-slung floorboard to the loftiest of ceiling rafters. And as per the pre-Rapheliites, there are roses everywhere. Kaze carve through a set of perfectly-crafted art-house songs and everyone packed into the room – even the man picking courgette out of his eye – are sold. Because this is how music should be received and enjoyed. I have been – as we all have, I’m sure – to gigs in festivals and football stadiums and every other kind of kooky enormodome you might conceive of. But at the end of that road I find myself most at home back at places like The Castle – back rooms of pubs where bands like Kaze play gorgeous, up-tempo pop numbers for music nuts. And throw things at you. This is not looking at rock stars on 2D screens erected next to the stage – this is 4D entertainment. This is immersive. This is the environment where you’ll retire to the snug after the gig and then make space for the band themselves, who are also enjoying a post-gig snifter. This is the way to do music in Manchester. Kaze are Mancunian immigrants and we need to support and celebrate honourary Mancs, just as BBC Manchester, BBC Introducing and 6Music have done. Check the video for Pinned On You. It’s a one-shot money shot of musical loveliness.